No collection of paraphernalia would be complete for a car collector without including a nod to a company like Packard. Lovers of automobiles everywhere remember Packard for its large engines encased in stylish bodies that provided smooth rides with powerful purring engines. Image Time builds every clock to high standards of reliability and quality. Image Time has received global recognition for the longevity of neon clock design which tracks well over 100,000 hours for over a decade of service. Professional and courteous customer service - we answer the phone! Collectors can now add a piece of history remembering these classic cars by hanging a Packard Automobile Neon Clock on a wall. This clock is a great gift for car collectors and enthusiasts! 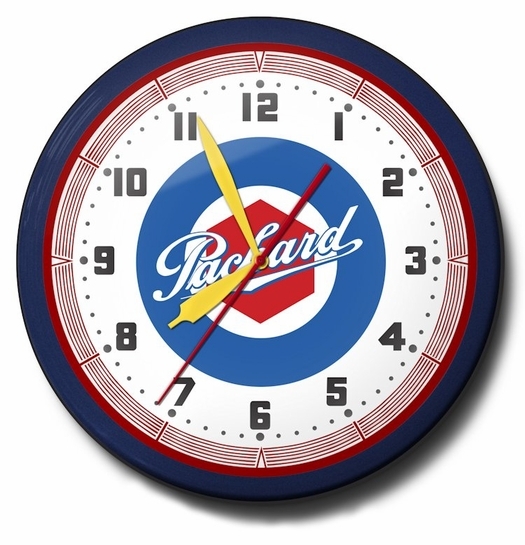 Subject: Neon Clock for Packard Automobile fans and enthusiasts. Ask a question about Packard Car Neon Clock, High Quality, 20 Inch.